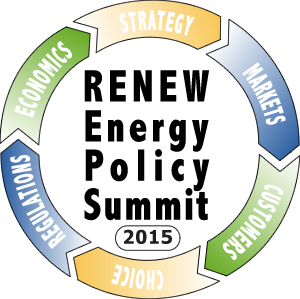 (Madison) – At its fourth annual Energy Policy Summit, RENEW Wisconsin will recognize the largest, and the most innovative, renewable generation projects built in Wisconsin in 2014. Titled “Unlocking the Clean Energy Transition,” RENEW’s summit will take place January 9, 2015, at UW-Madison’s Union South. The 16 clean energy projects inducted into RENEW’s Honor Roll added 5.92 megawatts (MW) of new generating capacity in Wisconsin. Of that total, the two hydropower projects--Badger Hydro and Angelo Dam--account for slightly more than 3 MW. In the biogas category, Gundersen Health System recently energized its 600-kilowatt Sunny Side Digester installation northeast of Sun Prairie. The other 13 generators, accounting for 2.27 MW, are solar powered. Many of the solar projects fit the definition of Community Solar, either involving a single array sponsored by customer subscriptions (a/k/a solar gardens) or a single contractor installing solar electric systems in a particular neighborhood. Combined, the projects will provide enough electricity to power the equivalent usage of about 2,600 Wisconsin homes. Perhaps representative of a shift in attitudes on distributed renewable generation, two of the projects to be highlighted are owned by electric providers. One project, Kaukauna Utilities’ Badger Hydro, involved reconstructing and upgrading an existing unit, resulting in a generating capacity increase of nearly 3 MW. Barron Electric Cooperative owns its 100 kW solar garden outright. In addition, electric providers sponsored the construction of four solar gardens in Wisconsin, three of which—Vernon, St. Croix, and Barron--are supported by self-selecting customers. In exchange for their up-front contributions to the array, these customers receive a credit on their monthly bills. Over the course of their subscription period, typically 15 years long, these customers should receive a financial return in the neighborhood of 4%. In addition to the utility-sponsored solar gardens, this year’s Honor Roll includes two neighborhood-based Community Solar initiatives organized by a single installer. In Black River Falls, Ho-Chunk Nation supplied 45 solar electric systems installed by PV Systems, Inc., and serving residential households, while in the Bay View neighborhood in Milwaukee, Arch Electric energized 38 individually owned solar electric systems there. Also to be honored are eight solar installations serving manufacturers, faith communities, a brewery, an airport maintenance facility and a public museum. “The Energy Policy Summit is a fitting venue to honor the people and organizations that embraced the vision of energy self-sufficiency and job creation, and brought these ideas to fruition,” said RENEW Wisconsin’s Executive Director Tyler Huebner. “Their solar, hydro, and bioenergy installations created jobs, reduced the flow of imported fossil fuels into Wisconsin, and demonstrated responsible environmental stewardship. They truly deserve the recognition, as well as everyone’s appreciation,” Huebner said. A list of the projects that earned a spot on RENEW’s 2014 Honor Roll appears on page 3. RENEW Wisconsin leads and accelerates the transformation to Wisconsin's renewable energy future through advocacy, education, and collaboration. More information on RENEW’s Web site at www.renewwisconsin.org.